We saw this photo of yours and really love it! On February 14, 2006, GE Healthcare will launch a worldwide initiative to encourage people to share photos and stories of how they stay healthy. Go to www.ge.com/health and add your photo by February 10, 2006 so your image can be displayed in Times Square in celebration of World Health Day. P.S. Unfortunately, we cannot respond to your questions individually at this time. If you miss the deadline for early submission, you can still participate in Picture a Healthy World on February 14th. You hereby grant GE and any of its third party vendors engaged to provide services to GE in connection with the Program, the unqualified, unrestricted, unconditional, unlimited, worldwide, irrevocable, perpetual and royalty free right, license, authorization and permission, to publicly display …[snip]… take advantage of and exploit any and all of the rights set forth herein in connection with the marketing, advertising and promotion of the Program and any products, goods, features, functions, capabilities and/or services associated with us. It’s only 700 pixels at it’s widest so they’re limited in what they can do anyway. 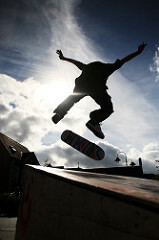 If anyone sees the flying skateboarder in Times Square, drop me a mail, I’d love to hear about it! Later… There’s more on Flickrnation – apparently the account was deactivated shortly afterwards because it was regarded as spamming. Pretty outrageous that they don’t even send you a freebie for your trouble! I replied to the mail, and they replied too. They said they’d send me an email when it went live on their website and when it will be displayed in Times Square! My sister is going to be in New York in April. I tell her to look for it and take lots of pictures if she sees it!